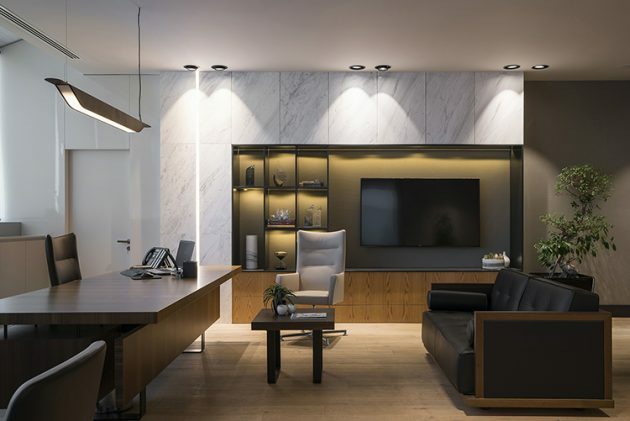 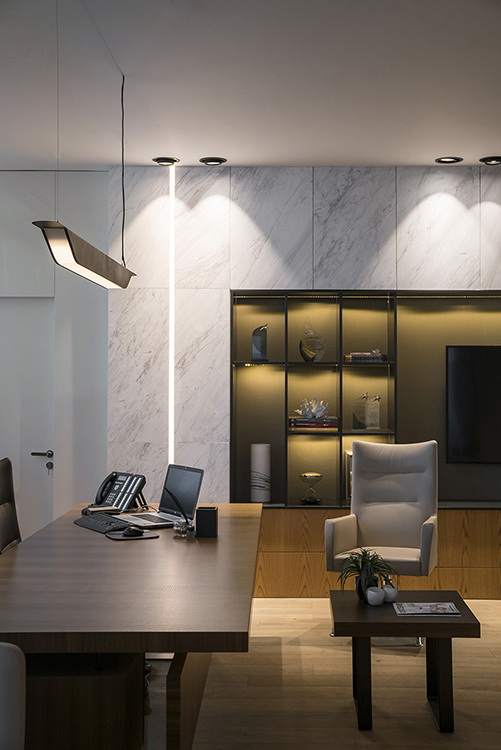 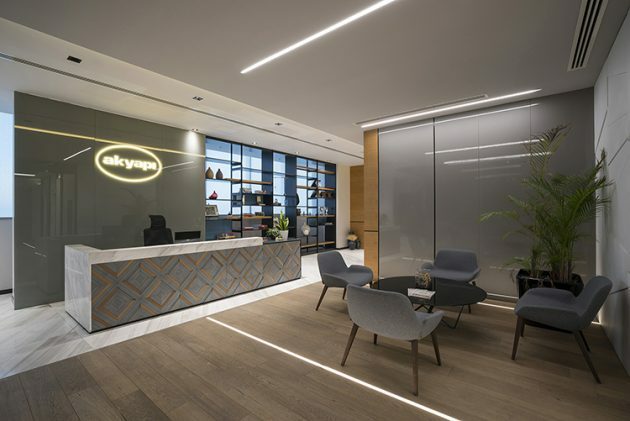 Gonye Proje Tasarim have designed the Akyapi Office in Istanbul, Turkey. 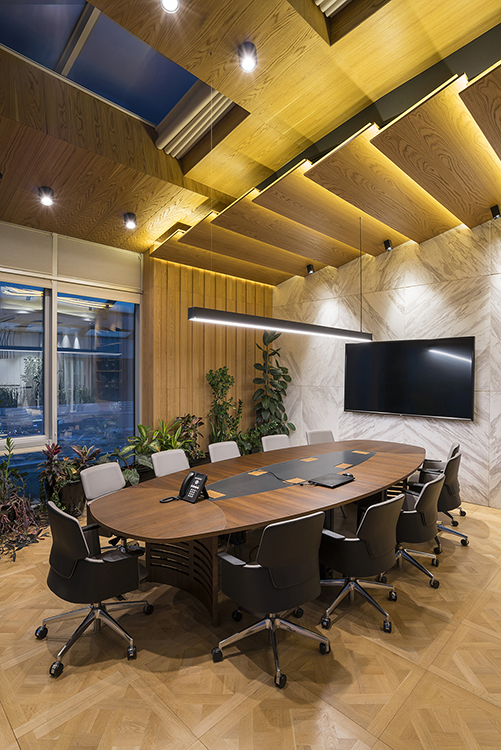 They have put an emphasis on comfort but they also wanted to make providing a functional modern working environment to the priorities. 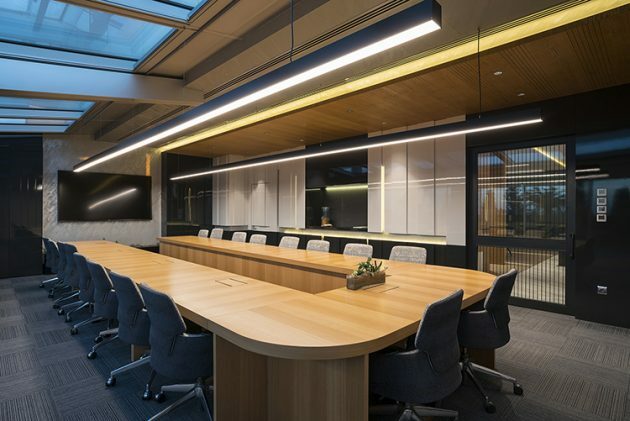 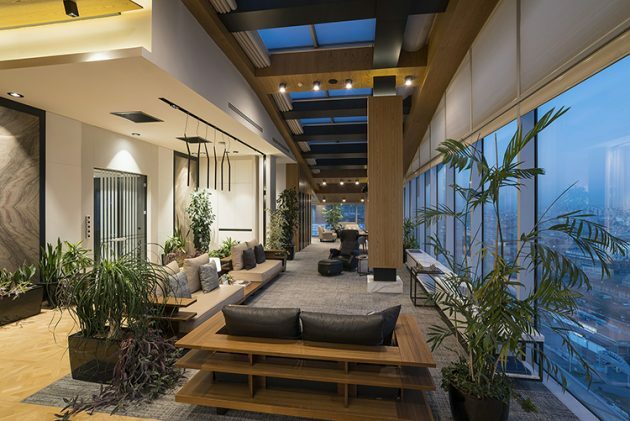 The architects have made sure that all of the employees can work comfortably by providing plenty of space to work but also chill out in, including multiple help desks and a beautiful cafeteria that breaks away from workplace stress. 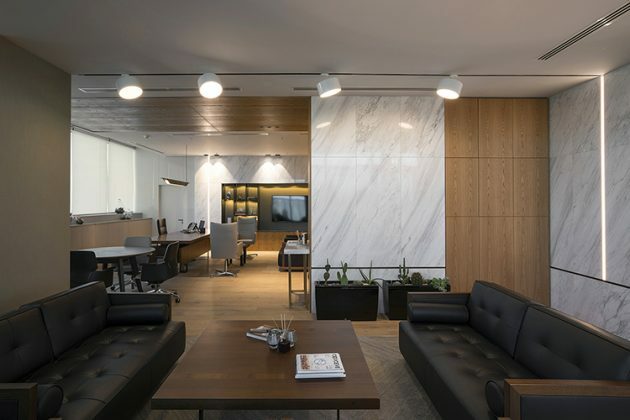 Architect Yelin Evcen and Interior Architect Gönül Ardal, founders of Gönye Proje Tasarım which has put its stamp on the interior design of outstanding branded residence and office projects in Turkey, have aimed at designing working environments in which comfort and functionality are prioritized, and where one can spend time with pleasure in an appealing atmosphere at the corporate office of Akyapı Company. 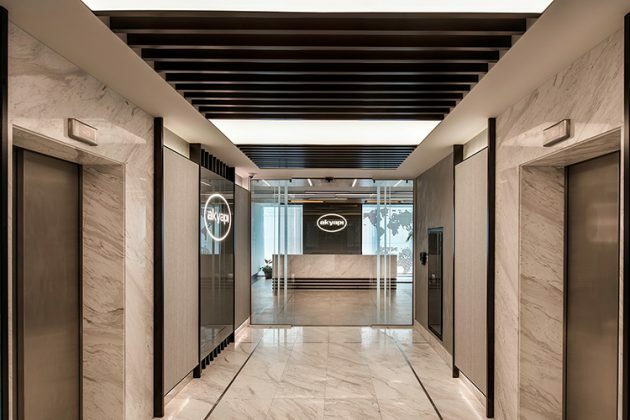 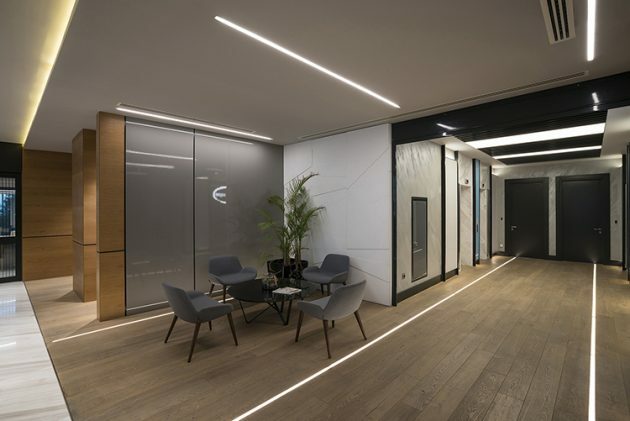 Gönye Proje Tasarım achieved a modern and elegant style in the entirerity of the three floor office and made a dynamic design by taking into account the young average age of the company employees. 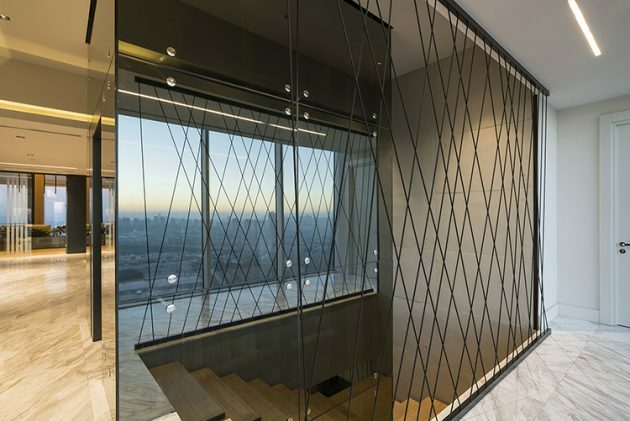 Gönye Proje Tasarım which undertook the interior architecture of Metro 34 office building which was constructed by Akyapı and the top three floors of which were being planned to be used as the company headquarters, designed each floor for different functions and created the spatial setup most suitable for the users. 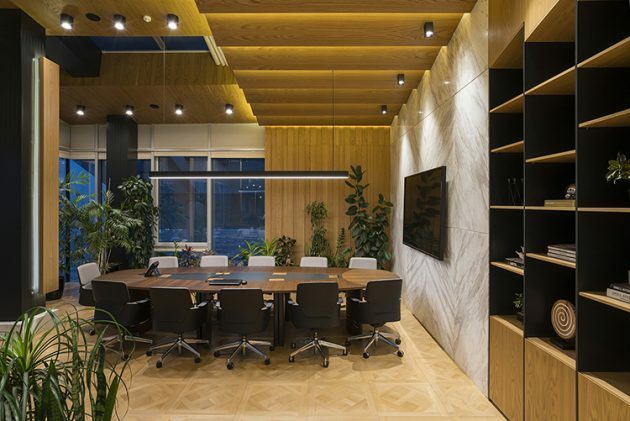 There are working offices, meeting rooms and a cafeteria on the first floor of the project, the second floor has been designed as the management floor with managers’ rooms and the assistant and guest lobby and also a large meeting room. 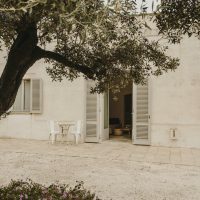 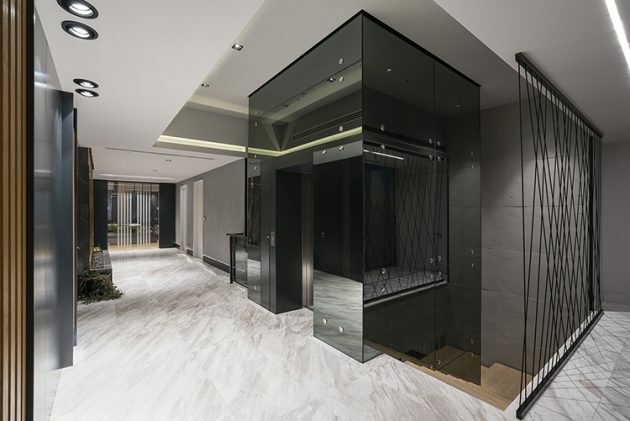 On the third floor there is a VIP room with a high ceiling where special customers and guests will be hosted, and also a kitchen at the service of this room as well as a gymnasium. 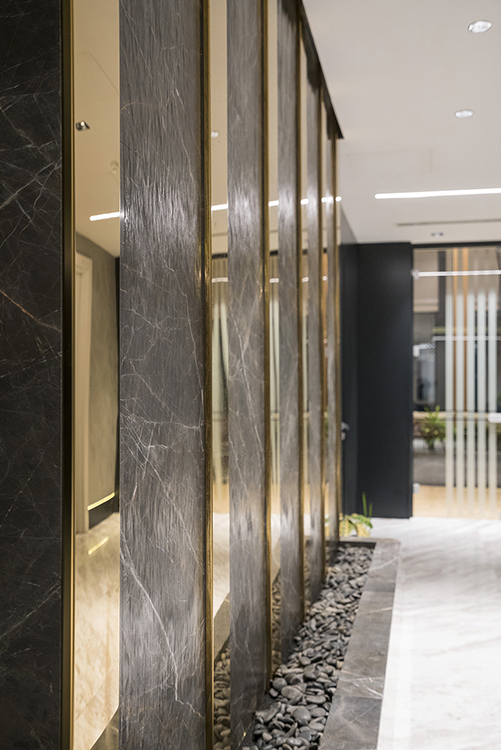 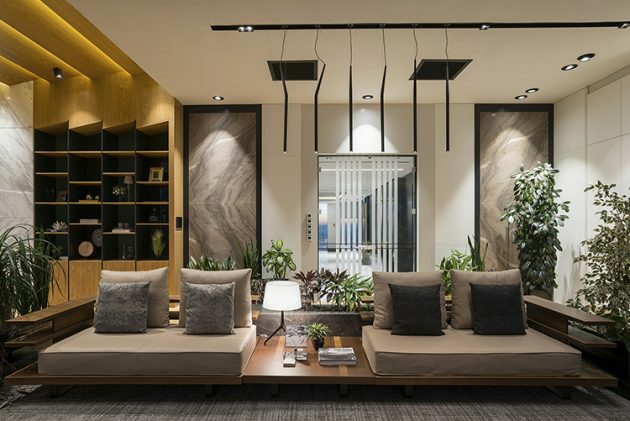 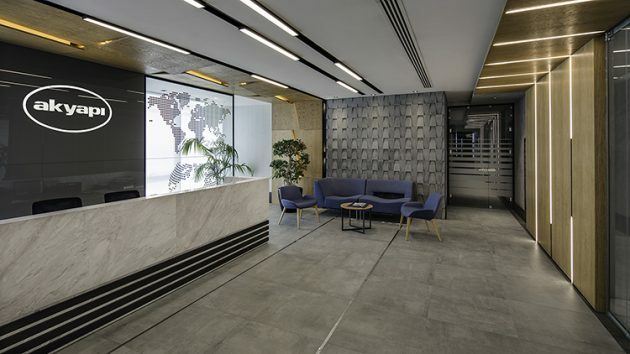 There are help desks on two floors of the Akyapı Office and Gönye Proje Tasarım has preferred to use three dimensional concrete materials and leather panels on the vertical surfaces of the waiting lounges. 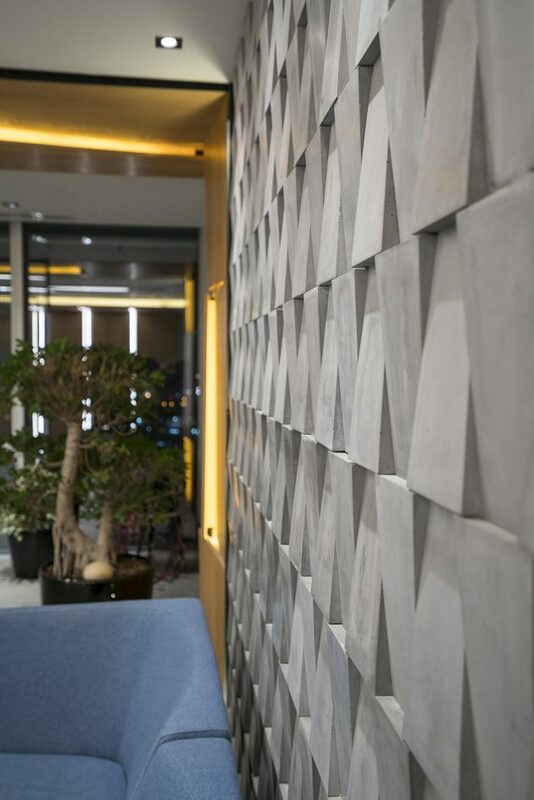 On the first floor they used exposed concrete next to wooden panels on the walls and wished to amplify the sculpture-like effect of the panels by use of hidden lights. 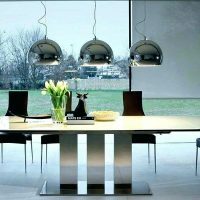 Additionally, on a part of the back wall of the counter, a glass separator has been preferred in order to allow natural light inside. 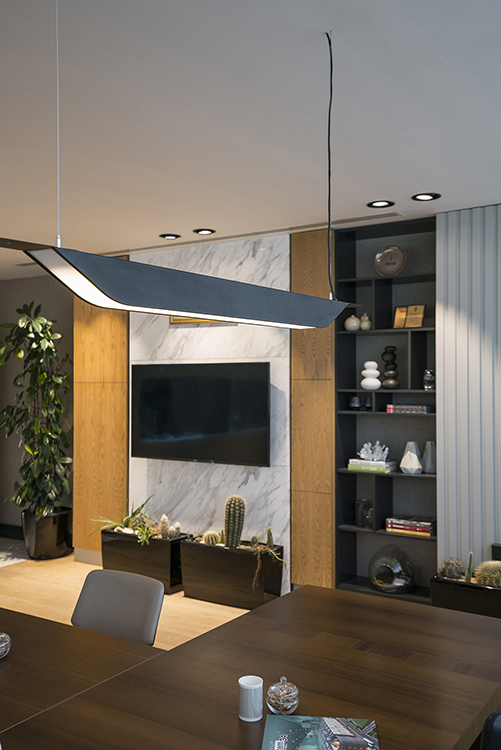 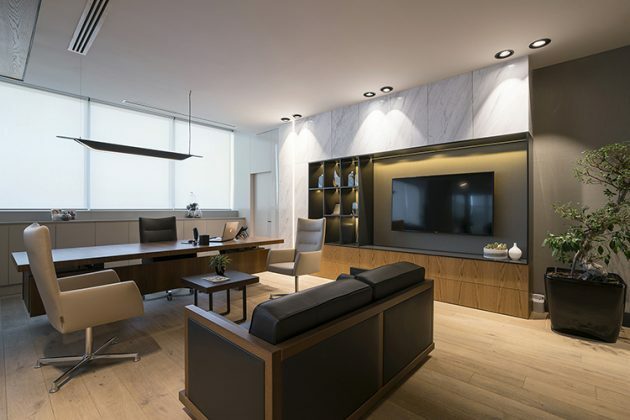 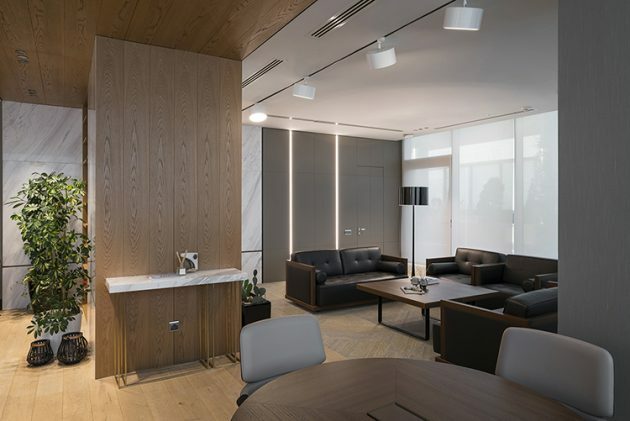 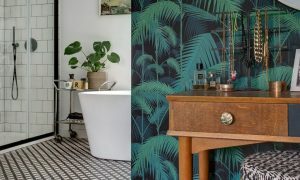 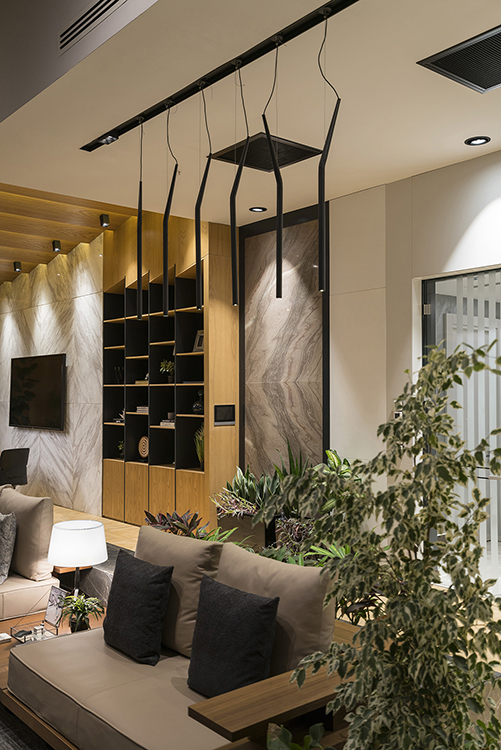 Gönye Proje Tasarım planned the workrooms of the company partners by taking into consideration their personal tastes and hobbies so that they can work in a functional and comfortable environment and host their guests with pleasure. 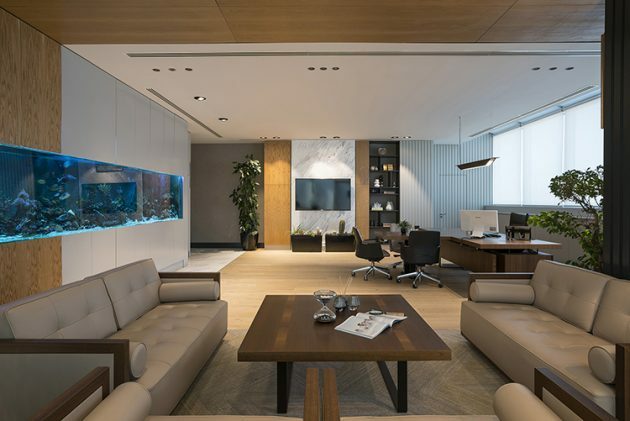 They have designed a six-meter-long aquarium and a special cabinet integrated in it. 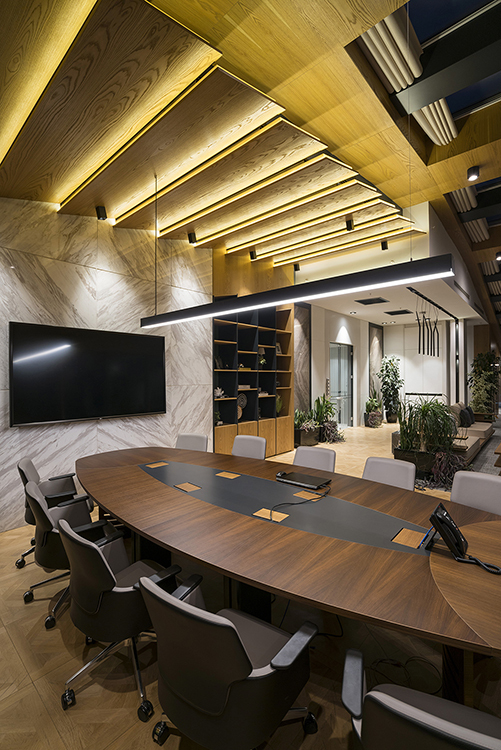 Gönye Proje Tasarım has prioritized comfort and selected ergonomic designs for the office furniture and used natural leather, metal profiles and special fabrics in the furniture in order to create an elegant office atmosphere. 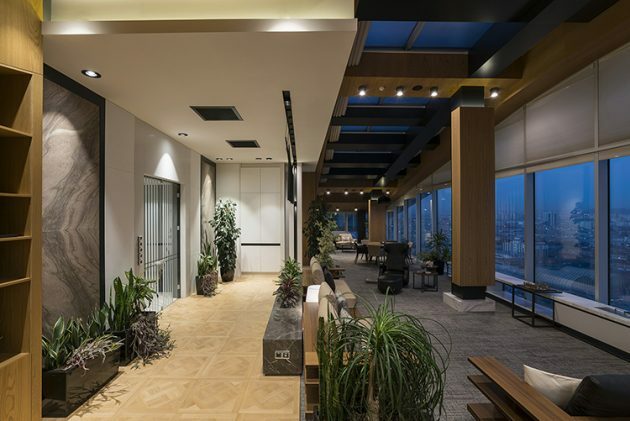 Gönye Proje Tasarım has allocated large areas for landscape and created green areas around the office with large botanic terraces. 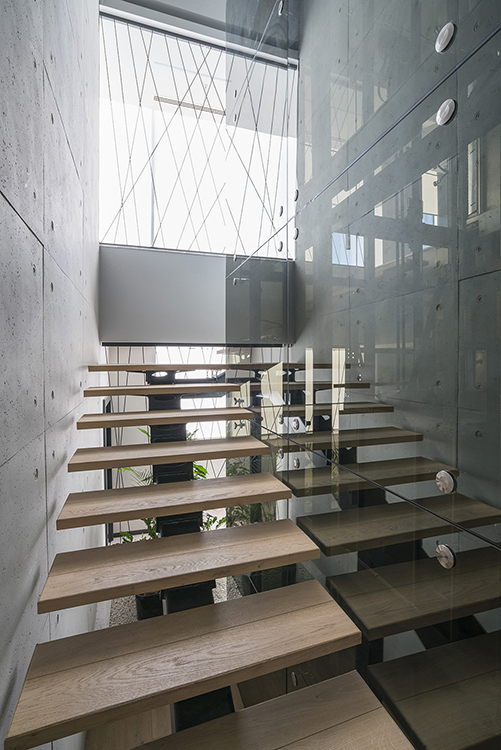 Large glass facades have been used in order not to interrupt contact with the plants and multiple exits to the gardens were built. 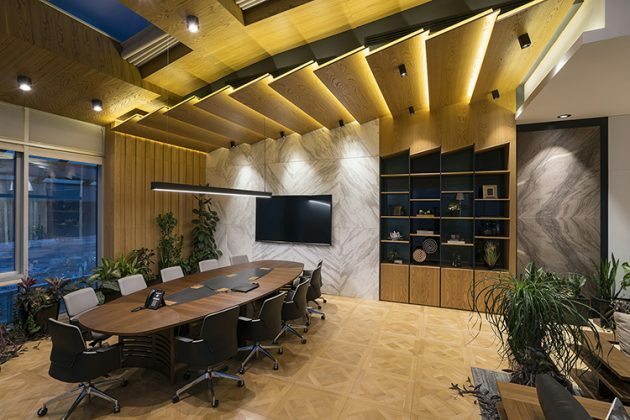 The VIP Room has been designed as a multi-purpose venue where the board meetings will be held, where the company managers will host their guests and have meals with them and also in order to rest. 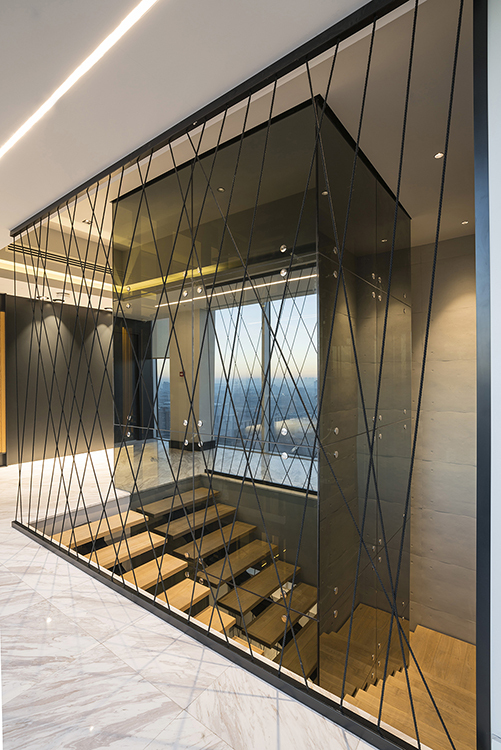 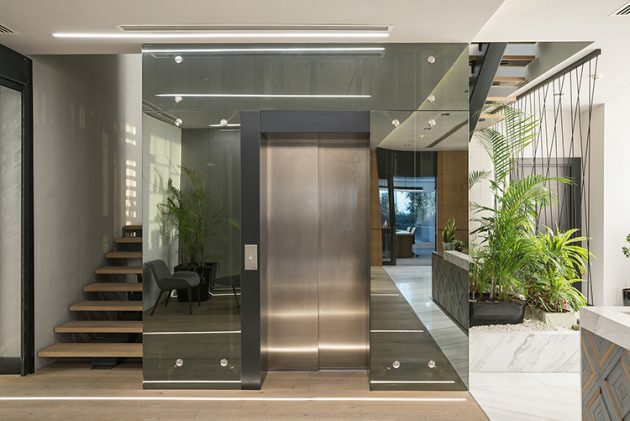 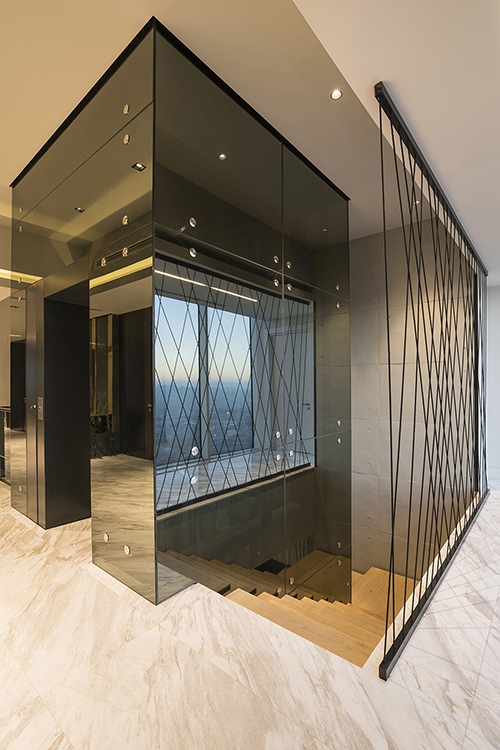 Gönye Proje Tasarım used reflective glass to cover the lift which goes upto the VIP floor from the management floor, used steel construction in the lift area and used massive wooden floor for the steps. 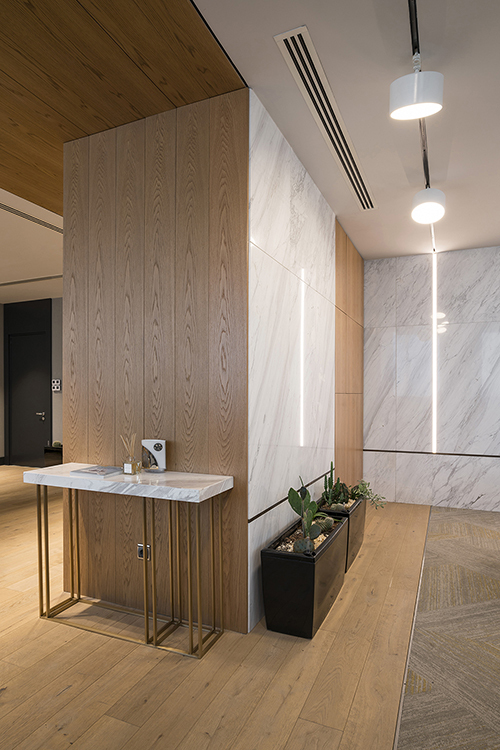 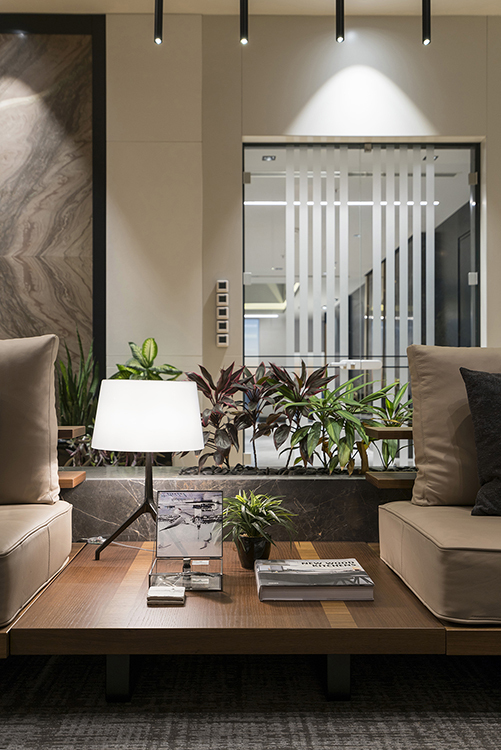 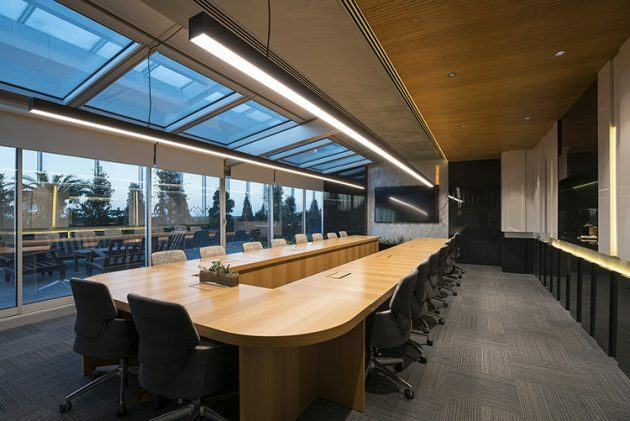 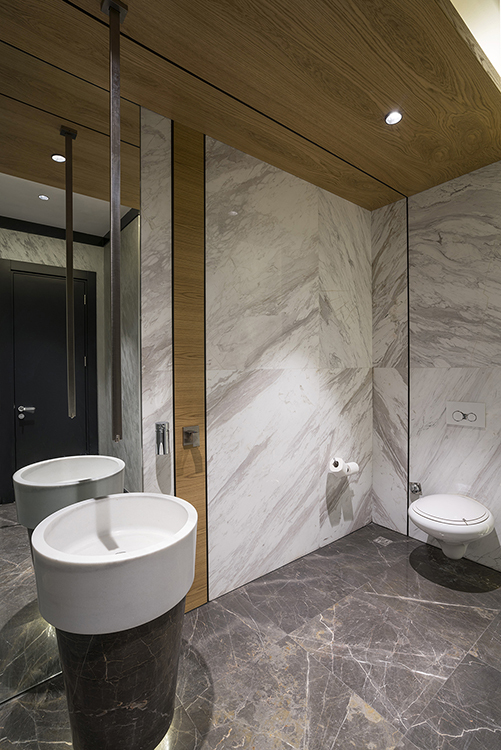 A prestigious and modern location has been created using exposed concrete panels and natural materials together with hidden lighting. 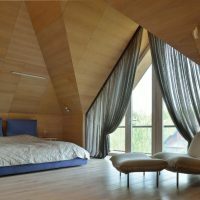 In the room which is surrounded by glass on three sides and the ceiling, there is a motor-driven curtain system to shade the light when desired. 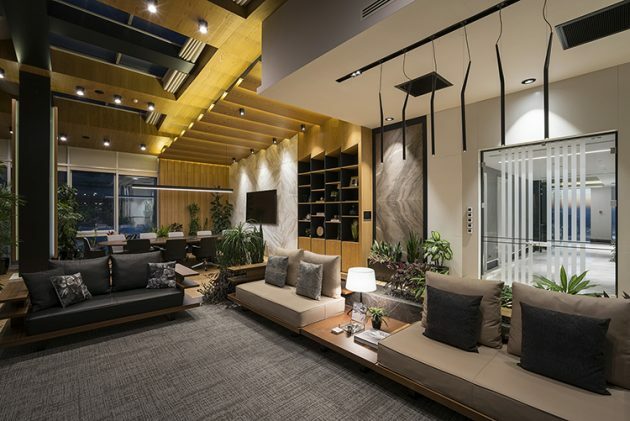 This venue has a high ceiling and in order to give it a warmer atmosphere the supporting steel beams and columns have been covered with wood siding and hard coal color lace to create contrast with the wood and supported with hidden lighting and spots. 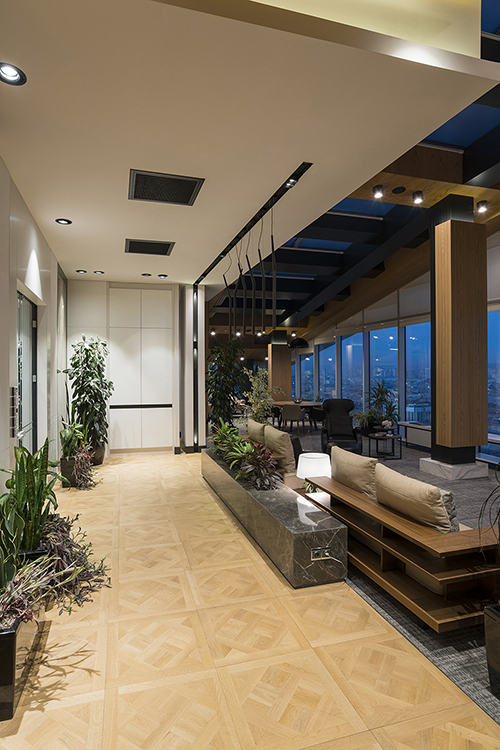 The ceiling is inclined in some areas so as to match with the architecture of the building. 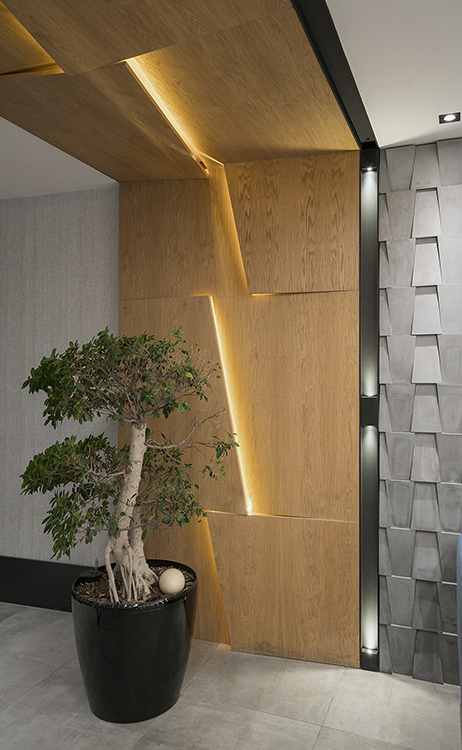 Interior Architecture office Gönye Proje Tasarım founded by Architect Yelin Evcen and Interior Architect Gönül Ardal in Istanbul is taking on many interior architecture projects alongside construction and real estate investment companies with which they are working as solution partners in particularly residence, housing estate and office projects. 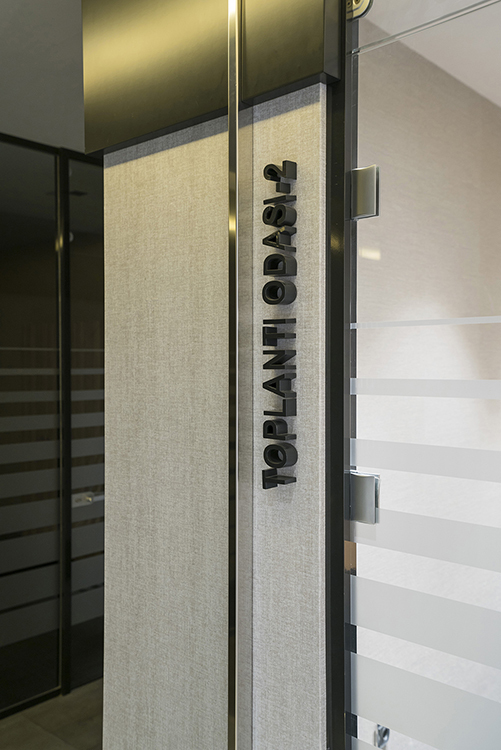 Gönye Proje Tasarım starts their projects in line with the tastes, lifestyles and requirements of the persons who will live in the designed locations and completes the projects after a concept presentation prepared according to the data received from the employer, price analysis, preparation of construction drawings, following up on the construction, quality control process and on time delivery according to the work program. 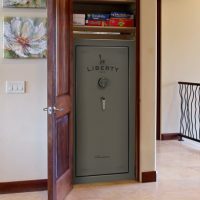 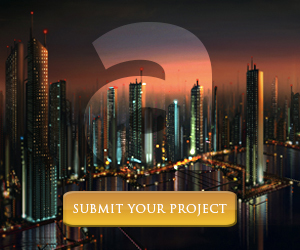 On one hand, they pay great attention to preserve the concept of integrity created by fine details starting from the design story of the project until the last point during the implementation and on the other hand they ensure that the project is completed within the cost limits determined. 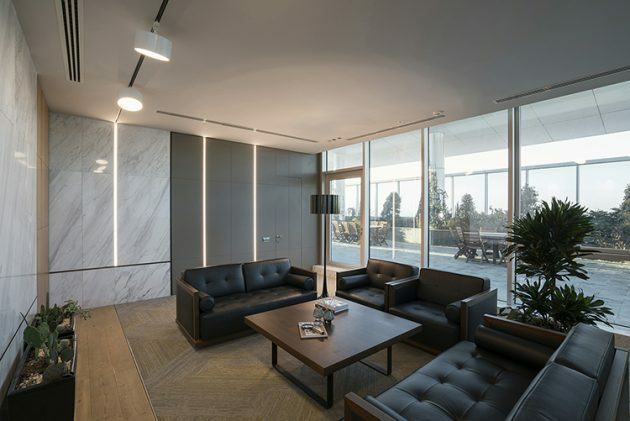 Gönye Proje Tasarım makes a difference in the sector with their design philosophy based on functionality and elegance, completing their projects with the aim of putting forward a concept spirit which results in customer satisfaction in the venues that they first imagine to construct and accomplishing good quality projects that don’t replicate each other.